Home » Sebastian Huber ensign of St. Fiden. Switzerland military uniform. Sebastian Huber ensign of St. Fiden the high Principality of St. Gallen Contingent. Sebastian Huber Fendrich von St. Fiden dem Hochfürste St. Gallischen Contingent. 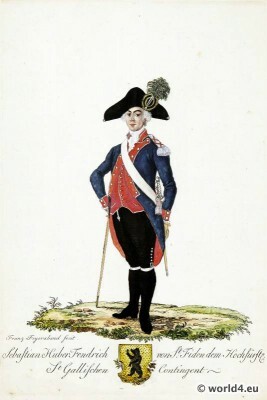 This entry was posted in 18th Century, Military, Switzerland and tagged Canton of St. Gallen, Costumes militaires des cantons de la Suisse on 6/7/14 by world4.